This cold winter may have dampened or even chilled our willingness to try growing tender or border-line tender plants in our gardens. So maybe now is the time to take stock of those that have stood this winter's hardship test and sing their praises. Top of my list is the plant I reckon I could have made my fortune with when I had my own specialist plant nursery - Libertia peregrinans 'Gold Stripe', commonly known as the New Zealand Iris or 'Mikoikoi'. There are 15 species within the family Iridaceae. Some 12 years ago I acquired a few small pieces of this golden bronze strappy leaved grass-like plant. It was in my acquisitive grasses collection days when my hoarding instincts were high. I just knew that its unique colouration and persistent evergreen habit would make it a really useful addition to my nursery plant list. It also became one of the key components of a large gravel garden I had built and only slowly did it reveal its potential. I say slowly because it seemed to take ages to spread into anything like a reasonable clump. Meanwhile I was hovering, keen to propagate from this 'mother plant' and bulk it up, both to use further in the garden but also to provide plants for sale in the nursery. From those early tentative planting experiments I now use it in containers, as an en-masse ground cover, amongst grasses and in architectural plantings. 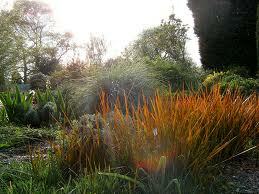 "What is that bronze-coloured grass in your gravel garden. Do you have any for sale?" Each time I was asked this question the frustration mounted. But whilst this Libertia was taking its time another larger species was revealing itself as made of sterner stuff. 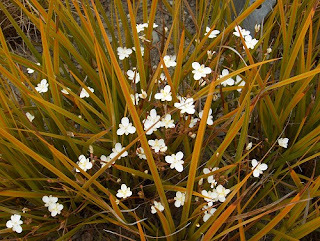 Libertia grandiflora is an altogether more robust character. It is grown widely here on the Isle of Wight. Introduced from the Ventnor Botanic Garden seed list it has become a popular tough coastal evergreen, good in naturalistic, herbaceous and gravel garden plantings. I have even seen it growing out of a stone wall in Kinsale, Western Ireland. A myridad of tall stems appear in June bursting through the coarser iris-like leaves with tight little buds radiating around the stem which soon open into a mass of small clear white blooms. L. grandiflora has the largest of the flowers while L. ixiodes is a smaller flowered version, finer in all aspects. As the blooms fade the seedheads turn into attractive dark mahogany tight clusters. Just like Phlomis russeliana they are tough reliable plants with good evergreen foliage for all year round interest with attractive flowers and enduring seedheads and like the Phlomis those seedheads can produce masses of babies. I have now learnt to thin the stalks of both to reduce the self-seeding. Fortunately for us gardeners the world of micro-propagation has speeded things up and my once hard to come by Libertia is now being offered widely. With the additional bonus of other coloured variants of Libertia ixiodes, L. 'Taupo Gold', L.'Taupo Sunset' or L.'Taupo Blaze'. These can be sourced from one of my favourite cornish nurseries, Burncoose Nursery. But for those of you with patience and a love of growing from seed I notice that Ray Brown of, 'Plant World Seeds' also has the original in his current catalogue. I appreciate the colour contrast of the newer Libertias but my heart will always remain true to Libertia peregrinans 'Gold stripe' - it didn't make me a fortune but it enrichens my life still. 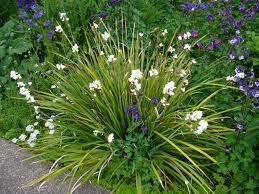 You are right about the Libertia 'Gold Stripe' being slow to spread. The clump we collect our seeds from for our seed catalogue has taken 25 years to grow 6 feet wide! But it is, as you say, an absolute beauty and definitely non-invasive! CB: Wow Ray,6ft in 25 yrs! I always knew you must be a man of patience. Thank God for it, so now all those seeds can be shared amongst us enthusiasts. Well, if it grows out of a wall in Kinsale, it should grow here on Bere Island! Great post about this plant which I will take note of and hopefully plant in whatever garden is to be my next! I shall also 'fave' (I hate that expression!) you in my botanicals plot, from whence I found you.